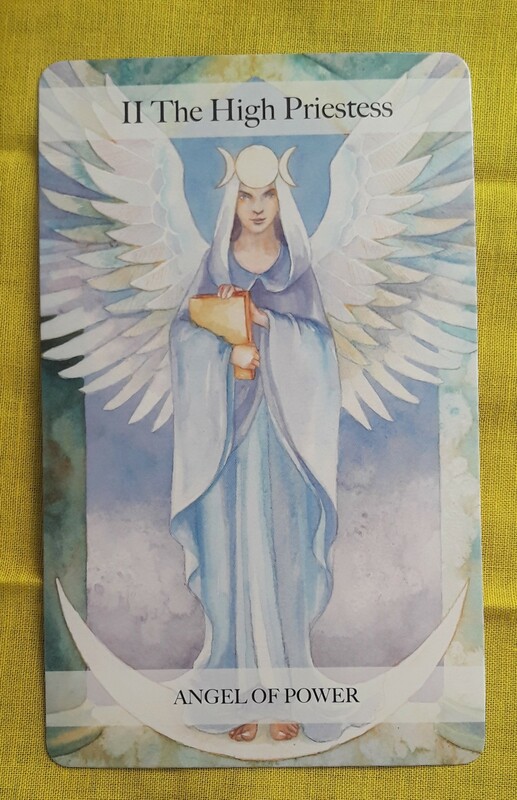 The Tarot cards for today are the High Priestess (Angel of Power) and the Nine of Swords (Stress). 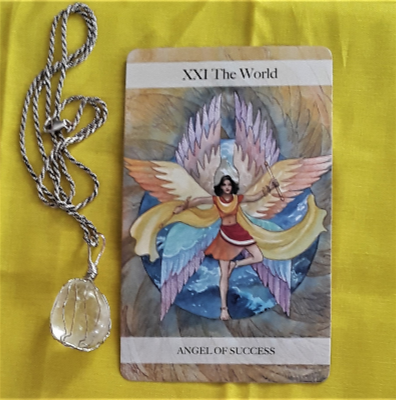 Now is the time to start digging deep into your inner world to help solve any issues you may have. How do you feel and why? What are the events that led to that feeling? Some of the things you dig up may cause you to feel uncomfortable and stressed. But bringing these feelings to the surface is the only way to begin resolving these issues once and for all. The Tarot cards for today, Saturday, and Sunday are the Nine of Swords (Stress) and the Knight of Wands (Action). It’s easy to get carried away with worrying thoughts to the point where you become stressed out. If you can, take some deep breaths. Instead of thinking about what has happened in the past or what could happen in the future, take action. What can you actually do to make things better? What can you do to try to prevent something from happening? In both of those cases, the thing to do is to deal with the here and now. 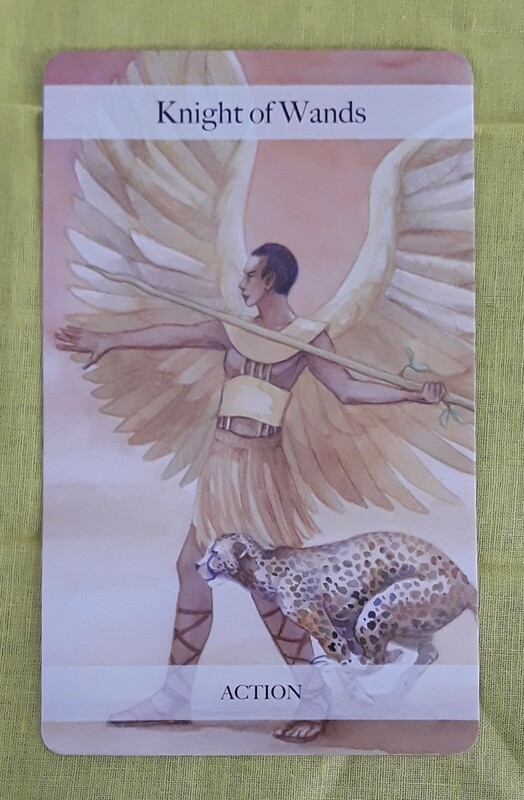 Today’s Tarot card is the Nine of Swords. This could be a day where anxiety is getting the best of you. To help get through this, try to put things into perspective. Take each challenge step by step, one at a time. Are the challenges as big as they seem to be or is the worrying making them appear bigger? Make sure you are not creating a problem where none exists (I’ve been known to do that!). You are only one person: if you need help, ask for it. If everything can’t be done in one day, that’s okay. Do what you can with the time you have. Remember: Nightmares end when you wake up to consciousness. Stay positive and have a great day. Hi, everybody! 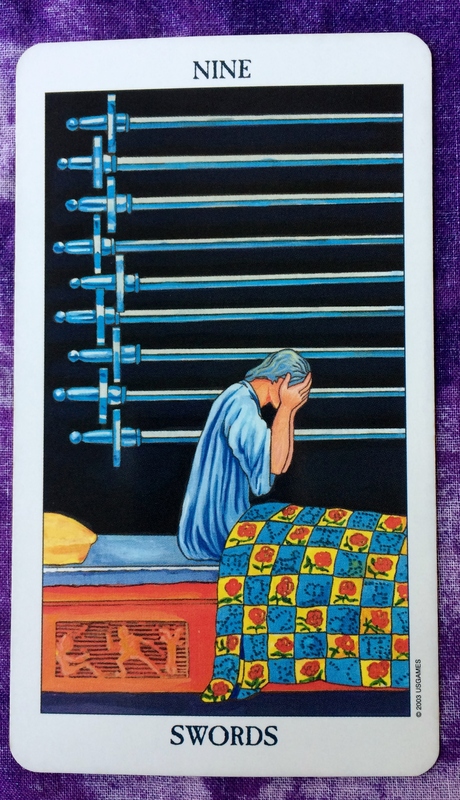 The Tarot card of the day is the Nine of Swords. Are you freaking out about things going on in your life? Take some deep breaths. Feel the air as it goes in and out of your lungs. Get out of your head and back into your body. If you have time, take a walk today, even if it’s a short one. Once you feel more grounded, hopefully you will see that your worries are not as bad as they seem and quite manageable. Hi, everyone! 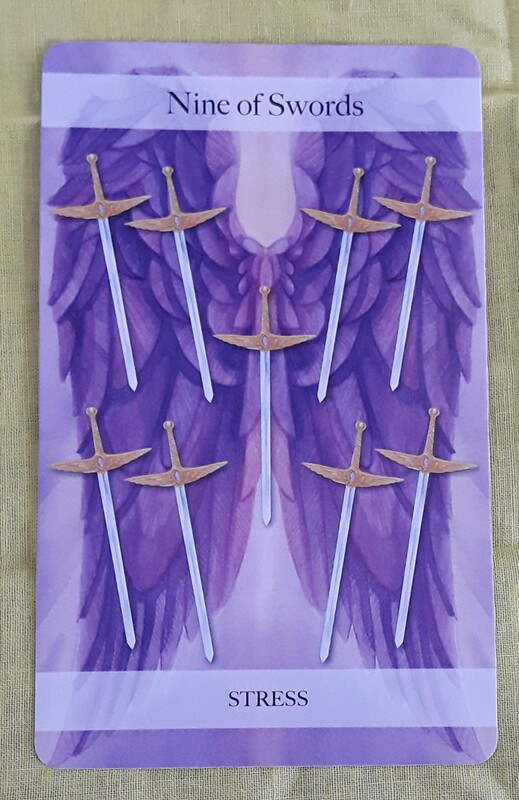 The Tarot card of the day is the Nine of Swords. This is the same card we had for the past weekend. This means that any concerns you have been dealing with lately are still on your mind today. Again, remember that this is temporary. Also, any pressure you feel is an invitation for you to find healthy ways to calm your nerves. One way is to shed light on the problem, perhaps by talking it over with a friend who can help or by writing about it in your journal. In any event, try not to let your nagging thoughts fester silently in the dark. Wishing you much love and clarity.